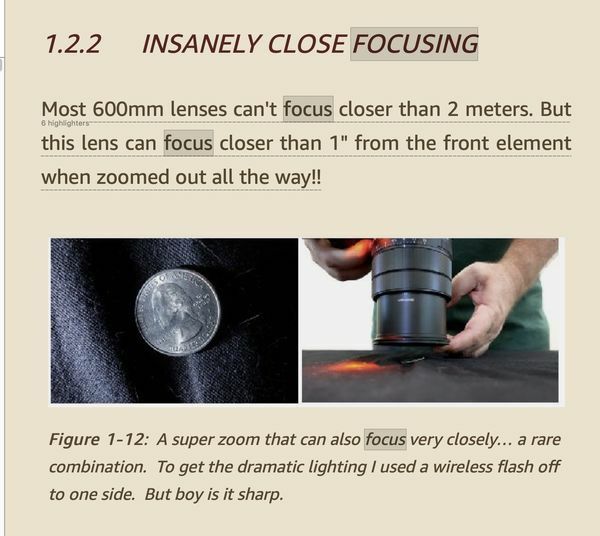 The author states the camera can focus down to 1 inch at full zoom. I have not been able to duplicate this, with .93 Meter being the closest. Has anyone been able to do this with the stated camera? If so, please tell how. Photo guide book author Alex White did a video on that very subject. Perhaps it can help you. Thanks for the link, rook, but White had basically the same results I did. His video was interesting, however. 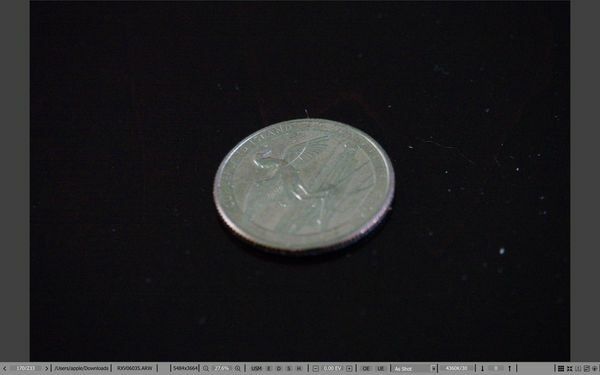 Friedman illustrated his short commentary on this with a photograph of the camera with fully extended zoom at about one inch from a coin and stated perfect focus. Perhaps Friedman can bend light? Have you looked at the specs from SONY? You have the camera, I take it. When looking at the rear screen or the viewfinder, and manually focusing at the minimum focus distance, the distance scale shows .92M (to the sensor, not the front of the lens) - infinity at full zoom. 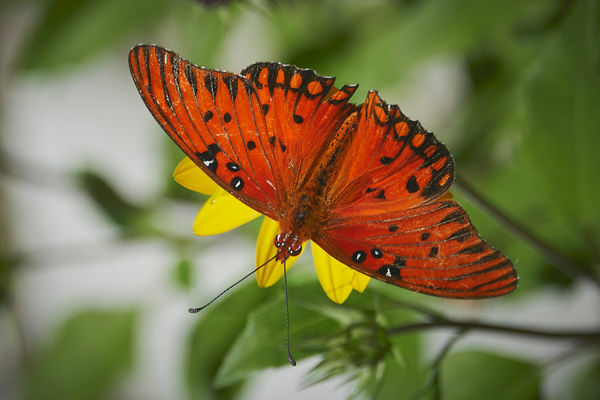 At minimum zoom you can get as close as a little over 1" (to the front of the lens). The camera, the White video, and the printed Sony specs all agree on the mfd at max zoom. I'd go with that, and disregard Friedman's claim. Or you can always write to Friedman and ask him the same question. Yes, Bill, I have looked at the specs. However, I have seen things on other cameras that were possible that were not covered in the specs. I would hope that somewhere along the line in publishing a book an error such as this would be caught. Just to cover all bases I'm throwing the question out to a realm of experts on UHH, has anybody been able to duplicate the seemingly impossible? Friedman has some work-arounds on features that were not designed into the camera with clear instructions on how to... On this focus issue it's just a flat statement it can be done with no elaboration. Thank you, Gene. If you haven't been able to do it I'll consider the case closed. I thought I was missing something along the way. My copy cannot do that unless I'm missing something. Here are best closeups at widest and narrowest angles of view. The larger image is widest aov, so close my lens was bumping the table. The one at longest equivalent length was manually focused using DMF. The exposures are crap but that was not the point. These are screen captures from FRV. The OP appears to have misunderstood the illustration. In the illustration, the camera is at its widest setting. The wording is confusing in an otherwise excellent book. Your image is much clearer than my copy which is greatly underexposed. However, he says "out all the Way". If he meant IN all the way there would be nothing to write about, as that is common. And, yes, other than that it is an excellent book which I would have been lost without. I can't tell you what the image magnification is at either end - but it does produce a bigger subject at the minimum focus distance when zoomed to 220mm (600mm field of view). I don't think you missed anything - the author didn't write this very clearly at all. Gene, I think you have it reversed. 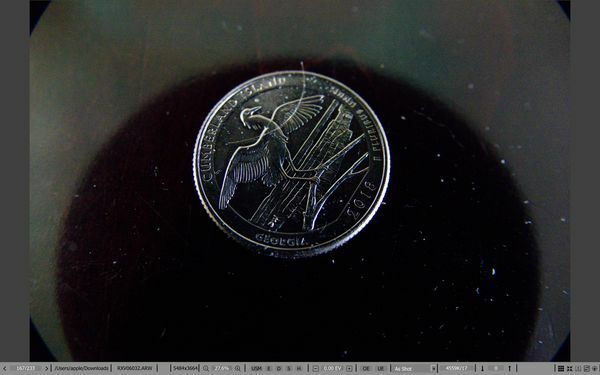 In my two samples the larger image was produced by the widest angle setting (also the best in other ways). The two images are close in size anyhow. Both are full images in FRV. I think we all agree that the wording in the book is, at best, confusing. His picture is correct for the not-quite-near-macro case. The distance to the subject is very small at the wide end. The minimum distance at the telephoto end is probably what Sony says it is - about 3'. This picture was done with that camera but it's cropped a bit (don't remember). It was at 600 mm equivalent. Sometimes it's not practical to come in super-close.